An excellent way to avoid queuing. I was just wondering if I can still visit Monet’s House and Garden in late March, 2012. 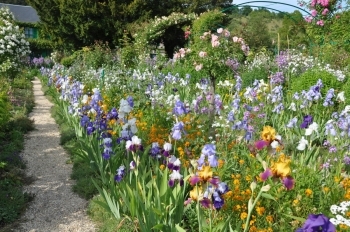 Thomas, Monet’s gardens are closed until 31st March, to bad! The first day is April 1st. Hello, We live in Milwaukee Wisconsin USA. We are interested in painting the exterior of this home the same as Giverny’s. How can we find out the name of the manufacturer of the paint and the names of the 3 colors. Green, pink and the trim seems to be a white of a cream color. Terry, it will probably be complicated to order from a French manufacturer, but I recommend a good book, Monet’s House by Heide Michels, on which you will find strokes of colors for each room and for the facade. You can rely on them to have a customised color prepared by your nearest painting shop. I would be happy to receive a picture of the finished facade! Bonne peinture ! Ariane, I enjoy your blog very much. I am visiting in June for two days. I’ve written to the foundation for permission to paint after hours either day, so I hope they will say yes! Here in Oklahoma our spring started a month early, and we did not have winter, so it will be very interesting to see what happens with our gardens. Does anyone know the name of the highly fragranced yellow azalea on the left hand side of the path from the entrance? We will be visiting Paris Sept 3,2014 to Sept 7,2014 and would appreciate information regarding train to Giverny and details how to get from the station in Giverny to Monet’s garden. Is the Tera museum of Art still ope? I wil in Giverny in late january, 2015. Is it open then? I will also be there in late February??? Unfortunately not. Giverny opens the last week-end of March 2015. I would like to buy tickets for April 10, 2018, however the dates are not highlighted for April. Is the museum closed. It had tickets available for March and May, but April is not available for purchase. Can I buy tickets for April 10, 2018? Digitick has April closed. Yes, April isn’t available yet. I suppose it will be online soon. Try again in a few days. Sorry for the inconvenience. Is there additional fee for changing the dates? My trip for Paris is for 8 days, June 29th to July 6th, I do not know if the weather will be good on that day. Can I book a ticket one day before? There is a limited amount of e-tickets for sale, and you are visiting in high season. If you don’t want to buy your admission ahead of time, you can also buy it on site, but be prepared to stand in line. I wish you a nice time at Giverny. Rosemary, you can order your tickets online. Just click on the green sign and follow the instructions. Have a nice time at Giverny! When I try to purchase online it automatically specifies 9:30 and doesn’t allow me to choose another time. Is my ticket good all day for what ever time I arrive? Yes, don’t worry, all the tickets have the same time written but you can arrive at any time. Have a nice visit. All I want to do is to buy a tickey. Why is this so difficult? Probably because the tickets are sold out for the next days. Easter is a long week-end. Giverny will be very busy. The website works perfectly, hundreds of people buy their tickets on line every day. Enjoy your time in France!